Just traded my old Cayenne for a new Cayenne S. Worth every penny and I couldn’t be happier. Thank you Champion Porsche. Coming back in the future for sure. Need a Porsche see CHAMPION and see Bruno. Bruno is the best most professional knowledgeable Porsche guy in the industry. He really works hard to earn the business and the best thing....no pressure. Thank you Paulo for helping me get my Mom into her new Macan. Had an awesome time at your gorgeous facility. Thank you champion Porsche. I just purchased a certified Porsche Targa from Niccole. During the entire process she was fantastic. She was so understanding, cooperative and a pleasure to work with during my trade and purchase. If you are going to buy from Chamion Porsche, largest Porsche dealer in USA, ask for Niccole. I took delivery of my 991.2 GT3 at Champion Porsche. Drove it, loved it. Co-signed it with Mark Chue for my new 991.2 GT3RS, which I’m currently driving at the moment. Love it. Process was quick, Mark handled everything for me and walked me through my build spec. Thank you Champion Porsche! Bruno was awesome. I’d recommend him to anyone. Patient. Attentive. Helpful. Not pushy. I believe he truly cares about customer satisfaction and long term relationship building. He’s the real deal! And I love my new Porsche! Such an incredible experience. Thank you Manfred on helping me with my purchase of my Porsche Cayenne. Great to work with, quick process and I enjoyed the hands on walk through he did with me before I drove away. All the little things that count. Thank you Champion! My girlfriend and I recently were in the market for a new SUV. Went to Porsche West Broward, Collection and Champion. Champion blew all the compeition away by miles. Amazing time, great staff and quick process. Thank you Mark Chue! Searched for months to find the right car for my Mom. Couldn’t thank Paulo enough for putting my mom into her new Macan. Thank you Champion and Paulo. I had previously purchased a certified Porsche Cabriolet I ahd the car serviced at Champion and they the most professional and accomodating dealer. I had always wanted a Targa, BUT it had to be white with tan interior. Finally, Champion had one and I emaioled the dealer. Niccole replied and made the experience of trading my Porsche Cabriolet for the Targa a great expeirence. She is very cooperative, understanding, and proferssional. If you are going to buy a car from Champion...ask for Nicvcole. My family and I just moved down from Maryland to Pembroke Pines. Been searching all over for the perfect SUV to support my kids and I. So happy I was able to find and work with Manfred. By far one of the most professional Salesman I’ve ever experienced. Thank you Champion Porsche for my new 2018 Macan! Thank you Manfred as well for your near perfect work ethic. Jim Pappas and the whole team at champion is by far one of the best. I got my cayman fully loaded and the whole experience was mind blowing. The dealership is also beautiful. And Mitra was so nice and welcoming. It was the best experience in buying a car. I have been a long time customer of Champion Porsche and they have always done a great job for me. my sales guy is Waldemar who i recommend to work with! Excellent service from the moment we walked in. We got a shiny brand new leased Porsche. We walked around the showroom and I saw one I immediately fell in love with. The service department is seamless. They have an awesome cafe area with free coffee and snacks. Everyone is super nice and I am in love with my car! Definitely coming back for a Cayenne soon. My father-in-law has purchased several Porsches from Champion and has nothing but great things to say. So, when it came time for my wife (Jennifer) to buy her 2019 Porsche Cayman, Champion was the choice for us. Bruno Giordano went above and beyond in reviewing several options and packages for the Cayman including building her own. After some discussion we decided to go with a personal build out of Stuttgart, Germany and added the Porsche Delivery Experience in Atlanta (where we live). Bruno was amazing, keeping constant communication in every step of the process, aiding in any/all paperwork and letting us know where my wife's cars was in production/shipping. Bruno's recommendation to add the Porsche Delivery Experience was ideal and truly the icing on the cake! He helped secure a date for the delivery and made sure that my father-in-law was able to participate in the Delivery Experience as well. Arriving at Porsche Atlanta, we were greeted by an amazing team that had nothing but great things to say about Bruno and Champion Porsche. The Experience started with a delightful lunch overlooking the track, followed by a tour of the building and the vast collection of Porsches. We were then taken to the private Porsche Delivery Experience area where my wife was introduced to her personally designed Cayman. Chris Ivester; the Porsche Drive coach, spent nearly an hour and a half covering every feature and setting. From there, it was out to the track where Chris guided Jennifer in the mechanics and handling of an identical Porsche Cayman. They went through an extensive series of performance - acceleration, braking, handling and regaining control in limited traction situations. After an hour and a half Jennifer was given the keys to her new Cayman. We would have never thought to do the Porsche Delivery Experience if it was not for Bruno Giordano - I cannot honestly say enough on how AMAZING this entire experience was - THANK YOU BRUNO AND CHAMPION!!! 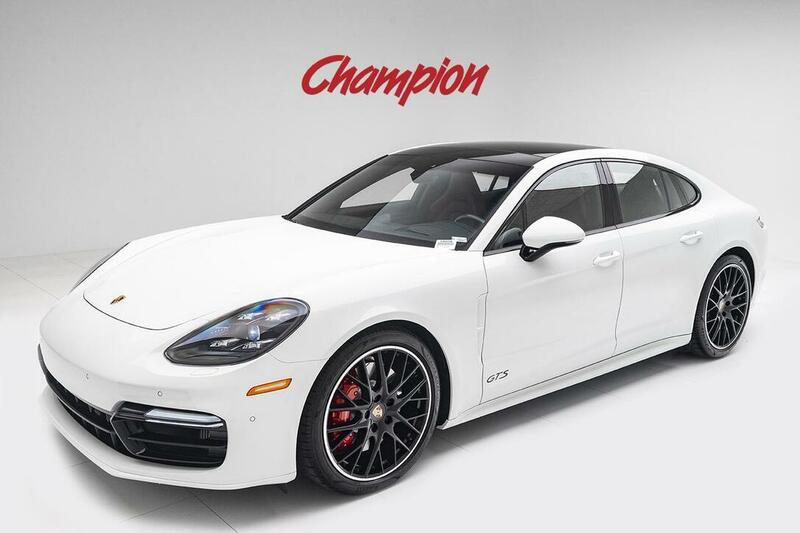 If you want to have the best possible buying experience, contact Bruno at Champion and I HIGHLY recommend the Porsche Delivery Experience if at all possible - it is worth every penny! I look forward to getting my Macan with professional guidance and support of Bruno and Champion in the near future. My wife and I had a fluid, hassle-free experience with this dealership when we purchased our vehicle last week. Waldemar Warkentin was extremely attentive and personable from the beginning of our search to the time we drove off the lot. All the dealership personnel were top notch and I'll be recommending Champion Porsche to anyone in the market to obtain one of these incredible automobiles! I just bought a Pre Owned Certified targa from Niccole in the Pre-Owned department. She was just fantastic in unbderstanding my needs and was extreemly patient throughout the process of trading and buying my car.This is the largest Porsche dealership in the US. I bought my previous Porsche from them and Niccole cartainly exemplifies the professionalism associated with Champion. If you are going to buy a Porsche, ask for Niccole. I just bought a Pre Owned Certified targa from Niccole in the Pre-Owned department. She was just fantastic in unbderstanding my needs and was extreemly patient throughout the process of trading and buying my car. This is the largest Porsche dealership in the US. I bought my previous Porsche from them and Niccole cartainly exemplifies the professionalism associated with Champion. If you are going to buy a Porsche, ask for Niccole. Been in the market for a Porsche for a couple of months for my wife. We worked with Brian on finding the right Macan for her. Brian was incredibly knowledgeable of the brand and made the buying process great. My wife is loving her new White Macan 2.0t. Beautiful Dealership as well! Highly recommended. I can't believe how easy it was to buy the exact car I wanted from inventory and purchase it in 1 day. This was all due to an incredible salesman named Manfred Mueller. My husband has been in the car business for 40 years and was blown away by Manfred' professionalism and manners. On top of that he knows his cars inside and out and is an absolute pleasure to be around. Do you self a huge favor and ask for him when you go there. You will be as impressed as we were! What an Amazing Experience at Champion Porsche..My salesman ALEJANDRO NEGREIRA is very Knowledgeable and Professional, and would definitely recommend him. I love my new 2018 Porsche Macan S!! Thank You Alejandro! !